BELIZE CITY, Thurs. 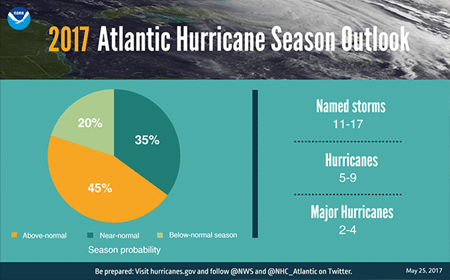 May 25, 2017–The 2017 Atlantic hurricane season—forecast now to be more active than normal—officially starts a week from today, on June 1, although the first named storm for the year—Tropical Storm Arlene—already emerged in the North Atlantic on the 19th of April in a month when such storms rarely emerge. A report released earlier today by the US National Oceanic and Atmospheric Administration (NOAA) announced that this year, the Atlantic hurricane season will most likely be above-normal, citing forecasters at NOAA’s Climate Prediction Center. “For the upcoming Atlantic hurricane season, which runs from June 1 through November 30, forecasters predict a 45 percent chance of an above-normal season, a 35 percent chance of a near-normal season, and only a 20 percent chance of a below-normal season,” the report said. For this year, forecasters predict a 70% likelihood of 11 to 17 named storms (winds of 39 mph or higher), of which 5 to 9 could become hurricanes (winds of 74 mph or higher), including 2 to 4 major hurricanes (Category 3, 4 or 5; winds of 111 mph or higher). In an earlier article, we reported that forecasters were expecting a near-normal year in 2017, with 11/12 named storms and 4-6 hurricanes, with 2 being major hurricanes. This year’s forecast calls for a higher chance of cyclone activity exceeding the 30-year average of 12 named storms and 6 hurricanes, including 2 major hurricanes. Last year is said to have been the first above-average hurricane season since 2012, with 15 named storms, 7 hurricanes and 4 major hurricanes. “Last year produced 5 land-falling storms, including Matthew that caused $10 billion in damage and killed 34 people in the US and 551 in the Caribbean. 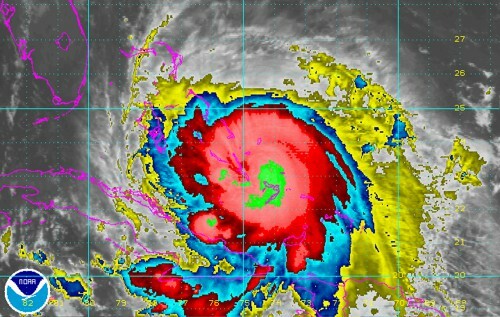 It was one of the deadliest Atlantic hurricanes on record,” the report from NOAA said. The only named storm to make landfall in Belize last year was Hurricane Earl, which struck in August. “The  outlook reflects our expectation of a weak or non-existent El Niño, near- or above-average sea-surface temperatures across the tropical Atlantic Ocean and Caribbean Sea, and average or weaker-than-average vertical wind shear in that same region,” said Gerry Bell, Ph.D., lead seasonal hurricane forecaster at NOAA’s Climate Prediction Center. NOAA explained that strong El Niños and wind shear typically suppress development of Atlantic hurricanes, so the prediction for weak conditions points to more hurricane activity this year. Also, warmer sea surface temperatures tend to fuel hurricanes as they move across the ocean. It also explained that climate models are showing considerable uncertainty, which is reflected in the comparable probabilities for an above-normal and near-normal season. NOAA said that it will update this outlook in early August, just prior to the peak of the season. The next named storm for the 2017 Atlantic hurricane season will be called Bret. The remaining storm names will be Cindy, Don, Emily, Franklin, Gert, Harvey, Irma, Jose, Katia, Lee, Maria, Nate, Ophelia, Phillippe, Rina, Sean, Tammy, Vince, and Whitney.